Aquascape professional-grade aeration system is designed to help improve water circulation and increase oxygen throughout the pond. 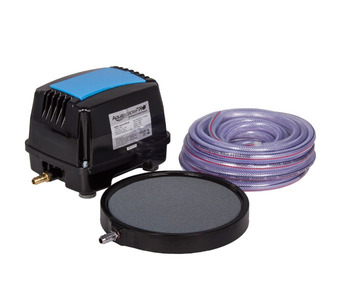 The Pond Aerator Pro system can also be used during the winter months where the bubbles created at the surface will keep a small hole open in the ice foe oxygenation and removal of possible harmful gases from the water. 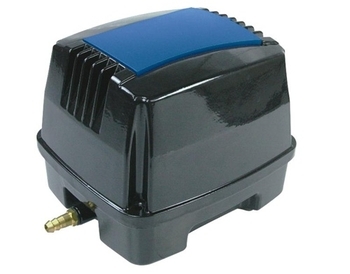 * Comes complete with a weather-proof, outdoor-rated, energy efficient 45 watt air pump. Remember to not place the air diffusers on the bottom of the pond during the winter, which may disrupt the natural thermocline found in the deeper portions of the pond where the fish are overwintering. Instead place the air diffusers about 1 to 1/1/2 ft. below the surface of the water. See Replacement Parts- Aquascape for additional repair items.